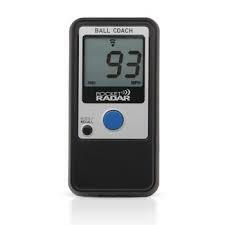 Ball Coach Pocket Radar™ is the world's smallest full performance radar gun. This award-winning device delivers the same great accuracy and performance as other professional radar guns, at a fraction of the cost. Perfect for a wide variety of applications including traffic safety and sports. Independently tested and certified to be accurate to within +/- 1 mph, it gives over 10,000 readings on a single set of batteries. Includes a hardshell case, wrist strap, 2 AAA alkaline batteries, and an illustrated Quick Start Guide.